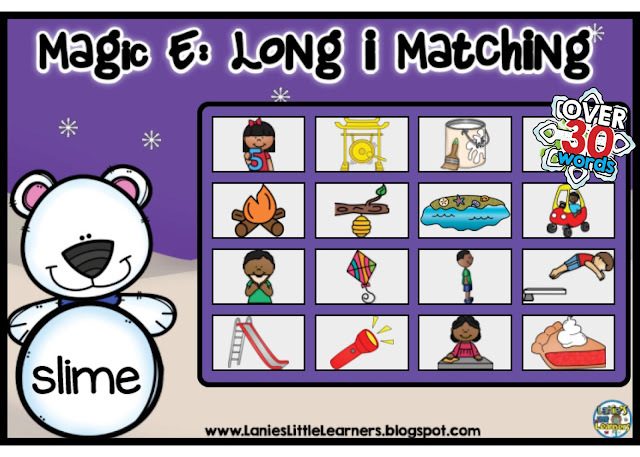 Long i (CVCe) Interactive Learning Activities Cont. OVER 30 Boom Task Cards! Students will practice reading and match Long i (CVCe) words. Perfect for whole group, small group, or intervention. Students just need a tablet, iPad, or computer and they can complete these task cards online. You can even use Boom Task Cards through your interactive whiteboard! These cards are self-checking and no prep, which means NO printing, cutting, or laminating! These are supplemental spelling activities to go along with Journey's 1st Grade Reading Unit 3 Lesson 15 Animals. Directions: Boom Cards play on modern browsers (released in the last three years) on interactive whiteboards, computers, and tablets. Boom Cards apps are also available. Not sure your browser is modern enough? Try a free Boom Cards deck first. When you redeem your purchase, Boom Learning opens an account for you if you do not already have one. For TpT customers new to Boom Cards, Boom Learning will give you, for one year, a free account that lets you track student progress for up to 80 students. At the end of that year, you may renew or choose not to renew. If you do not renew, you will be able to continue using Boom Cards with the Fast Play feature. Fast Play does not track individual progress. ELAGSE1RF2: Demonstrate understanding of spoken words, syllables, and sounds (phonemes). ELAGSE1RF3: Know and apply grade-level phonics and word analysis skills in decoding words.